Having a healthy and beautiful smile isn’t just a matter of dental work – it also requires regular preventative dental care to maintain. Prevention is always better than treatment. It’s much better to keep dental problems from happening than to fix them after they occur. A little bit of prevention saves both time and money. A proper preventative care regimen consists of both care you do at home, and care performed at regular intervals by your dentist. A proper home prevention regimen starts with brushing your teeth. You'll need to master the technique, and use the right equipment. Brush your teeth twice a day, moving the brush in a circular fashion. Hold your toothbrush at a 45 degree angle to your gumline. Make sure you brush on every tooth surface (top, front, and back) until you have cleaned your entire mouth. Also, brush your tongue to remove bacteria and prevent bad breath. Any soft-bristled, ADA-approved toothbrush is fine. Dr. Bowyer recommends that you try using an electric toothbrush - these can be more effective at cleaning and do a lot of the work for you. Just brushing your teeth won't remove the plaque that gets between your teeth. For that job, you need to floss. Floss once a day, using either waxed or unwaxed floss. The benefits for each type are the same - just use whichever one is more comfortable for you. Take a strand of floss about as long as your forearm, and wrap each end around the middle finger of each hand. Pull the floss taut, and use your thumb and forefingers to slide the floss down gently between your teeth. On each tooth, curve the floss and move it up and down the tooth so that you floss as much of the tooth as possible. Be sure to go as low to the gum as possible to get plaque in and around your gum line. Keep winding your strand of floss down so that you use a fresh bit of floss for each tooth. Continue flossing until you have cleaned your entire mouth. Rinse your mouth thoroughly with water after brushing your teeth. You can also use a disinfecting mouthwash for better protection against bacteria growth in your mouth. If you do use mouthwash, use the proper amount (look on the mouthwash packaging for recommendations) and swish it thoroughly in your mouth for 30-60 seconds before you spit it out. 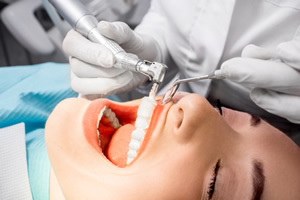 Regular dental checkups and cleanings by a dental professional are a key part of maintaining your oral health. How frequently you go to the dentist depends on your current dental health. Most people should see their dentist every six months. Patients with more regular dental problems should have a checkup or cleaning done every 3-4 months. If you’d like to set up a regular cleaning at our Vancouver office – don’t delay! Call Dr. Bowyer at (360) 253-2640 or use the form to schedule your appointment.